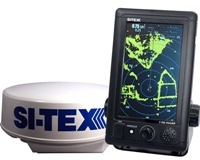 Big radar performance and features are available for any size boat -- and budget with the SI-TEX T-760. A vertically oriented, slim case boasts advanced touch screen technology and a host of professional features. Powerful 4kW output ensures superior target acquisition and tracking in the the most challenging conditions. and highly effective positioning and heading based smart antenna.